If you do not have reservations tonight and prefer to spend the day at home with your family vs a romantic dinner out OR have date night at home with pizza, popcorn and a movie, Little Caesars is a great option. Hot, yummy pizza at a fantastic price! We had a large sweet 16 birthday party for my daughter but did not break the bank doing so! We were able to feed a large group of teenagers AND my two younger daughters, a DJ and other parents for a small cost versus a small fortune. Thanks Little Caesars! 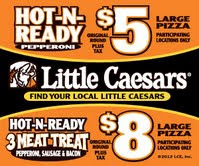 At home we love Little Caesars too - we get it at least 2 times per month. It is quick, affordable and the kids LOVE it. We have actually switched from one brand to Little Caesars. Thanks to Little Caesars I have a $10 gift card to giveaway (US only, 18 and older). That is 2 pepperoni pizzas! That is enough to feed the average family! You can find a location by you by clicking HERE. I will make this one simple. Just comment something you love about Little Caesars or what you look forward to trying. Please make a separate comment for either or both for up to 2 extra entries. A winner will be selected in 2 weeks at random. Email must be provided or publicly viewable in profile. If no response is received in 48 hours after notifying the winner, another winner will be selected. Have fun entering and good luck to all! Disclosure: I received a small token gift card as a thank you for sharing this information with my readers. I love their hot n ready pepperoni pizza! I love their Crazy Bread. Little Caesar's Crazy Bread is crazy good! Love it!! I LIKE you and Little Caesars on Facebook. I like their Ultimate Supreme Pizza! I love the low prices!! Like both on FB - Stacey Bic.